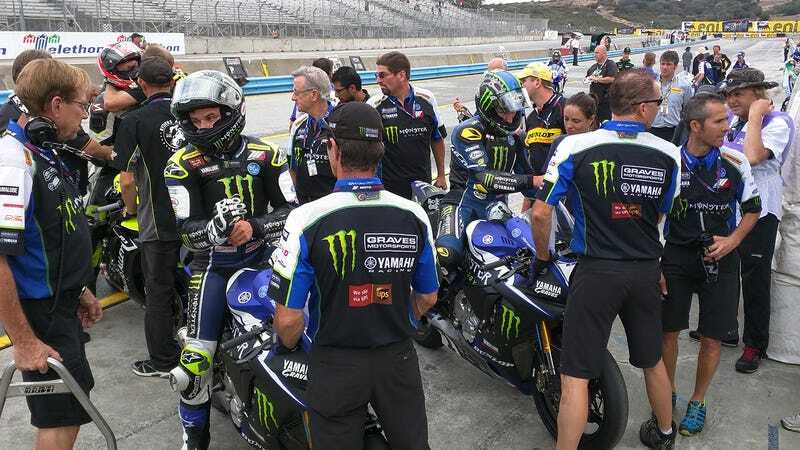 Yamaha racer Cameron Beaubier had just broken the 1:25 mark around Mazda Raceway Laguna Seca during SuperPole 2 qualifying on Saturday afternoon. He was at the top of the leaderboard for the Superbike class, beating out his Yamaha teammate and current points leader Josh Hayes. Then he slid out on the way into turn 6. He scraped across the tarmac and into the air barriers, his R1 flipping end over end. A hush fell over the Yamaha pits. There was concern. But not panic. And seven minutes left to qualify. Beaubier was up on his feet seconds after the crash. The team rushed to get a track cart to him and began quickly and clinically mounting pre-heated race tires and doing the dozens of checks on the backup bike awaiting him in the pits. With four minutes left in the session and after a quick chat from team members, he was back out on the track. Two minutes later he set the second fastest time of the day: 1:24.538. This was – by far – the most thrilling display of racing I’d witnessed during the past few days of embedding with the Yamaha Graves team. Seven races into the MotoAmerica series, Yamaha has been utterly dominant, and the lack of turmoil speaks volumes. The team isn’t just a well-oiled machine, it’s a logistical ballet of racers and technicians, leaders and crew. Yamaha’s roving band of racing professionals is lead by Keith McCarty, a Yamaha-lifer who’s worn nearly every conceivable hat in the company’s motorsports arm since 1977. He began working as a mechanic for Bob “Hurricane” Hannah, eventually pitting with dozens of teams and moving up through a series of leadership rolls before taking the reins as Yamaha Motorsports Racing Division Manager. Just this year he was inducted into the AMA Hall of Fame. McCarty is raw and focused, and runs a crew composed of people that have been with Yamaha not just for years, but decades – some as long as 32 years. That dedication says all you need to know about McCarty and his management style. He’s hands on, but doesn’t micromanage, trusting his people and giving them the autonomy to succeed. That challenge is hard to glean from the grandstands. This is Yamaha, after all, not just one of the best-funded teams on the grid, but also the most dominant in the series, with both Hayes and Beaubier sitting in the top two slots in the Superbike standings, and (as of this writing) tied for points. Each is racing the brand-new R1, basically the same bike you can buy at your local Yamaha dealer, but with some tweaks the team has made throughout the season to suit the new bikes to their established riders. The engine has been left alone because power isn’t an issue (“We knew that going into the season,” says McCarty), so the team has focused on wringing every last bit of performance out of the suspension, aerodynamics, and body, along with optimizing components for the rigors of racing – little things like being able to swap the front tire without removing the fender. Not that it shows with Hayes and Beaubier’s performance. But the work the two racers put on track is matched – if not exceeded – by the team in the trailers and under the pop-tents. “Every team member wears dozens of different hats,” says McCarty. And it shows the first morning they arrive. When I get to Laguna on Thursday, the crew is unloading countless wheeled boxes from the two tractor trailers to set up a makeshift camp for the weekend. Within the first hour, there’s a gridded floor, followed by awnings, then tables, then chairs, then work stands for the bikes and tool boxes. So. Many. Tool boxes. You’d think an army had descended on the pits, but it’s only a few more than a dozen crew members that, after years of experience, run on autopilot, methodically recreating Yamaha HQ one weekend after the next. Within a few hours, it’s done. “These guys are on the road all the time and it’s important to make them feel better than they do at home,” McCarty tells me during some downtime in the comparatively plush hospitality area. Yamaha runs a bit different from other teams. They’re not silo’d into individual outfits, but all working together, and in the case of MotoAmerica, offering support for other teams running the R1. They’re also ready for damn near anything, so when Beaubier came in complaining of damping issues out back, the team had a new rear shock swapped in within minutes right in the pits, and when he went off during qualifying, there was no hesitation about what needed to be done next. There was already a plan to swap the engine on Beaubier’s bike, something the team does about once every 1,500 km. That’s about a two and a half hour job on its own. But with fairing, handlebar, and other assorted damage to the R1, that plan was out the window. “I wouldn’t expect to get out of here before 7 (p.m.),” says Mitch Leonard, Beaubier’s chassis technician. There was no frame damage, but since part of the paint purple and black paint scheme was scuffed off in the crash, they decided to replace it (because they’re Yamaha). Within two hours, the R1 was nothing but a bare frame, with a new engine (number 00006) lying in wait. Where other teams are nearly frantic in the pits, the Yamaha crew just dives in with a sort of calmness and sense of purpose you only get after building, rebuilding, and becoming intimately familiar with a machine. A little over five hours later, it looks like the crash never happened. The R1 looks pristine mounted next to its compatriots in the paddock. You can’t tell the difference between the backup and its rebuilt sibling. As it should be. McCarty looks completely nonplussed. This is just another weekend for he and his crew. But there’s a recognition that few other teams could pull this off. He thinks of them as a family, with all the trials and tribulations that go along with it. “The worst part about racing is that its very humbling,” he says. But you get the sense for McCarty that it’s also the best part.